The most popular vegetarian recipes, and the best vegetarian recipes right here on The Spruce, as rated and reviewed by you! Everyone loves homemade oatmeal cookies, but these healthy vegan cookies with cranberries are a little special. 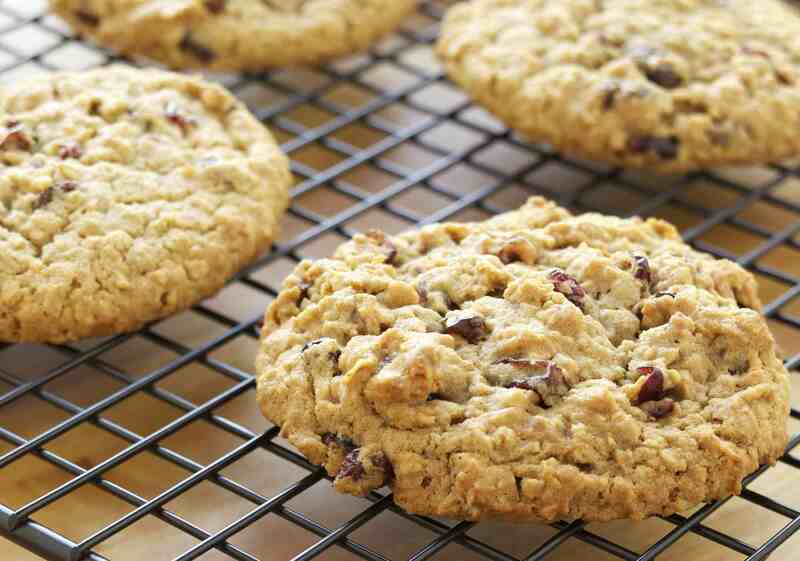 I love the addition of ginger and nutmeg as it makes these cookies extra flavorful. A dozen users have rated this vegan recipe as one of the best, giving it five out of five stars. Enjoy! If you like Chinese take-out, you'll like this healthy vegetarian Chinese-food inspired entree of broccoli and tofu in a simple garlic sauce. With over a dozen five-star reviews, this is one of the best vegetarian recipes you can find for a quick healthy dinner. Serve it with rice or your favorite whole grain. Of all the homemade vegetarian chili recipes I've ever tried, this one is, by far, my absolute favorite. I just love how the sweetness of the sweet potatoes combines with the spicy chili flavor. And, as it turns out, nearly a dozen people have agreed with me, giving this black bean chili recipe five out of five stars. According to the user reviews, kids, vegetarians and non-vegetarians all love this recipe, and it's delicious even as leftovers, making this one of the best easy vegetarian recipes to try. With a tablespoon of mustard to give it a yellowish hue, this tofu egg salad recipe really looks and tastes like egg salad. Don't tell them it's tofu, and you might even be able to fool them - they'll never know it's not made from real eggs! Enjoy a cholesterol-free eggless egg salad. One user who gave this vegetarian recipe five stars wrote, "I like this better than the real thing! It takes 2 minutes to make and is very satisfying." Dhal, sometimes spelled dahl or dal, is a staple of Indian vegetarian cuisine. This easy recipe is for a basic vegetarian and vegan yellow split pea dhal. Serve with rice, or, add extra liquid to make a more soup-like dhal. Caution - it's got a bit of a kick! This easy dhal recipe is very low in fat and is also low-calorie. This is one of the best vegetarian recipes, according to your reviews. According to reviews, this vegetarian lentil soup is one of the best vegetarian recipes. A reviewer named Lisa said, "Even my father likes it and he's one of the pickiest eaters I know." Another reviewer who is a college student on a budget wrote, "Hearty, easy, healthy-- and all in one pot! An inexpensive one-bowl meal that's great for people who hate lengthy recipes (like me)." If you want a tried-and-true easy vegetarian soup recipe, this is one of the best ones to try. If you want to try one of the best vegetarian recipes, enchiladas are a great and filling meal. Black bean and vegetable vegetarian enchiladas can be made in advance and frozen, so make plenty and set some aside for later. Try making your own enchilada sauce too for an even fresher home-made taste. Reviewer Andy gave these vegetable enchiladas 5 out of 5 stars and said, "This recipe was pretty easy...It's very tasty and economical and I think even people with traditional diets will love it. My wife and I are vegans and we are in heaven with this meal." Glad to hear it, Andy! If you've ever made vegetarian gravy, you know that the process is a bit different than making a gravy with meat-based drippings or fat. You've got to pack a lot of flavor into just a bit of sauce, and get it nice and thick to boot! Using mushrooms is one solution for adding flavor, as in this vegetarian gravy recipe. One reviewer had never made gravy before, yet found this recipe easy enough to follow, and one reviewer was able to find all the ingredients and try this recipe all the way from Beijing! This is one of those super-quick and easy vegan dessert recipes that you think will taste funny but are absolutely decadent. Peanut butter pie with tofu is a relatively healthy vegan dessert perfect for the kids (or the kids-at-heart!). One reviewer who loved this easy vegetarian recipe wrote, "I loved this recipe because it is easy to prepare, requires no baking and is very decadent." It's no secret that most vegetarians and vegans love a good tofu scramble. Try this curried tofu scramble recipe with spinach. One reviewer served it over rice, and someone else said it was excellent with bok choy instead of spinach. With five five-star reviews, this is one of my highest rated vegetarian recipes and one of the best vegetarian recipes, according to you! What do you think? One vegetarian recipe that everyone agrees is the best is this Greek quinoa salad recipe with traditional Mediterranean ingredients including feta cheese, kalamata olives, and fresh herbs. Omit the cheese to make it vegan. With eight five-stars reviews, this one's a keeper! It can easily be doubled for picnics and potlucks, another reason why it is one of the best vegetarian recipes and one of the most popular quinoa salad recipes. Everyone absolutely loves my tahini-based version of homemade "goddess" salad dressing! With nothing but five-star reviews, this is a simple homemade salad dressing you know is one of the best there is. Reviewers may disagree as to whether it tastes like the store-bought stuff, but they all agree that it's fantastic! The only recipe collection you'll ever need - it's all right here! From healthy low-cal and low-fat salads to indulgent desserts, exotic curries and lots of all-American favorites as well as new vegetarian recipes. Look here for more vegetarian (and vegan!) recipes.